A few of us of spotted this Bentley parked on the side roads. Then we realise it's not only us. Almost everyone was staring at it! I even saw a person from another building taking out his camera to take photo of it. I did the same thing. 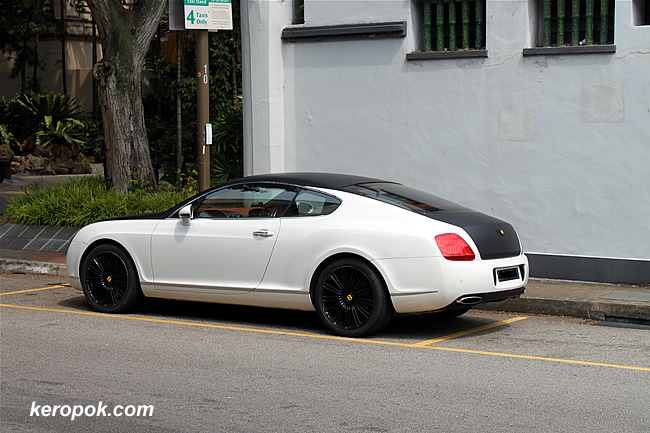 It's quite rare to see a Bentley in Singapore. It looks nice isn't it? The front view of it. Very unique black and white Bentley Continental GT. Is Archie's car a Bentley? I can't really remember. I have not read Archie comics for a long time now! Labels: Cars, Seen on the streets. Something wrong! I know, it's a colour of tail light. It must have a smoked colour lens. Very nice indeed. Someone must have some cash to splash! You have a nice Mazda too!